From 1962-1965 the Army Security Agency, operating under cover of the 3rd Radio Research Unit (3rd RRU), established a radio facility at Phu Bai in 1963, 12 km southeast of Huế on Highway 1. The operational unit was later redesignated as the 8th Radio Research Field Station (8th RRFS) (Kelley, 2002). The 3rd RRU continued to grow in numbers in response to expanded requirements. A mobile detachment was established at Da Nang, much further north, manned by 21 officers, 4 warrant officers, and 356 enlisted men. When the mobile detachment relocated to Phu Bai, even closer to the northern border, it became known as Detachment J. Phu Bai became a second permanent base for air operations -- 450 miles north of Davis Station in Saigon. ASA began plans for a major field station to be constructed at the new location that would accommodate nearly a thousand personnel and a hundred operational positions. However, in the summer of 1964, the politics of the conflict changed everything (Quinn, 2014, para. 6). 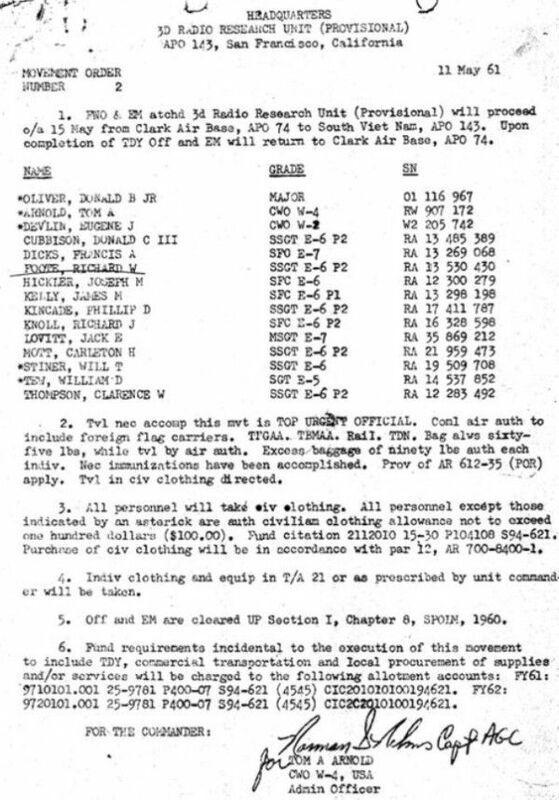 The only thing wrong with this information is that the 3rd RRU in Phu Bai was called Detachment 1 (3rd RRU Det. 1), not Detachment J.
LeGro, W. (n.d.) has a nice account of ASA but does not mention Det. 1. Instead, he calls it the 8th ASA Field Station in Phu Bai. I found a history of ASA, but Det. 1 is conveniently left out. We were, at the time, classified as Top Secret Codeword. However, this website does mention our efforts in the bush with “Green Beanies.” That group was called Military Assistance Command, Special Operations Group (MAC SOG) and we were never on the books. In fact, our passports were civilian. At Phu Bai, an airfield was across Hwy 1 which had two RDF aircraft. One was a Beaver, and the other was a twin-engine Beech. Kelley, M. (2002). Where we were in Vietnam. Central Point, OR: Hellgate Press. Checking out a possible location for a AN/TRD-4 DF site at Bien Hoa airfield, a couple of miles from Saigon. The bald one is me, the other is NCOIC of Hatien DF site. He was ambushed near Hatien several months before Davis was killed. The Viet Cong sniper missed him but hit his jeep. The villagers of Hatien, who were friendly with the DF team, captured the sniper and beat him to death.